A wonderful world created by your imagination that transport us to our own dreams. How beautiful you are, dearest Rosalind. Here is nearly summer and getting too warm for my liking. You just described my favourite childhood activity...suspended sheets were quite frequent in my home...and often I would try to make them in Oriental style or at least what I have imagined to be Oriental...probably the idea of it came from colorfully illustrated Bible...usually there were also colourful parrots flying around. Somehow I managed to convince my parents not only to let me have parrots as a pets but to let them fly around ( I always thought cages to be a cruel invention and couldn't understand the idea of putting an animal with wings in the cage). My brother on the other hand was more construction oriented and once we had build a home from stones and mud under an olive tree. ( a project that was of some interest even to adults around if I remember well). Anyhow, both indoor and outdoor dens were my favourite past time. Ooh what a lovely colour on you. When I was little I loved making dens from sofas and cushions too! oh. i love this post. its so beautiful and i connected with it deeply. thank you so very, very much. i also would like to mention that your dress is a dream. i totally understand the feeling of playing in it with bare feet. lovely. Wonderful as per. You inspired me to write. When I was as kid, this is precisely the sort of place I wanted to live. Your home always sounds so beautiful and magical! And yes--my URL does also read "and this i speak," which I don't actually like because I think it sounds trite. Rosalind these pictures are beautiful - and you look stunning. The orange against the blue sky and green trees: perfection!!! Such a wonderful dress! That orange tone of the dress looks wonderful reflected against the blue sky! It's nice to know that others made dens growing up, as my sister and I did the same. I love hearing about the fond memories from your childhood. The salmon colour dress is marvellous on you, and I like the black belt with it. I love the orange colour of your dress! I used to love making dens and still think of decorating my room as making a little space to hide away in! Have I already commented on this post? I don't think so... I really have to spend some good time, sitting down and catching up! Anyway, it was such a pleasure to open your site on this misty, cool May Day and see these bright, vivid images. I'm glad you're keeping alive your love of dens and cozy spaces. We have this odd half-room in our house, and I knew my toddler would love it for her bedroom for now. The movers kept arguing with me that it was too small, but I was right! She LOVES it in there and feels safe and cozy, sleeps through the night (almost) every night. Great title and glorious, glorious post. Your beautiful, vivid writing makes me feel the same sense of whimsy that I do when making and hiding out in my own dens. I used to do the same thing for indoor den-making (pushing two couches together, then putting a blanket over the top). I adore making dens. Indoor dens -with cushions, blankets and books a plenty - for cold days and outdoor dens hidden amongst trees and bushes for gorgeous, sunny days. This post reminded me of how, when a childhood friend of mine would come over on occasion, we'd climb up into a tall Casuarina tree that grows beside my house and we'd collect sticks, twigs, and leaves to make little nests in between some branches that were close together. 'Orphans on the run' was also a story we'd play at (as well as 'shape-shifting tree dragons'). 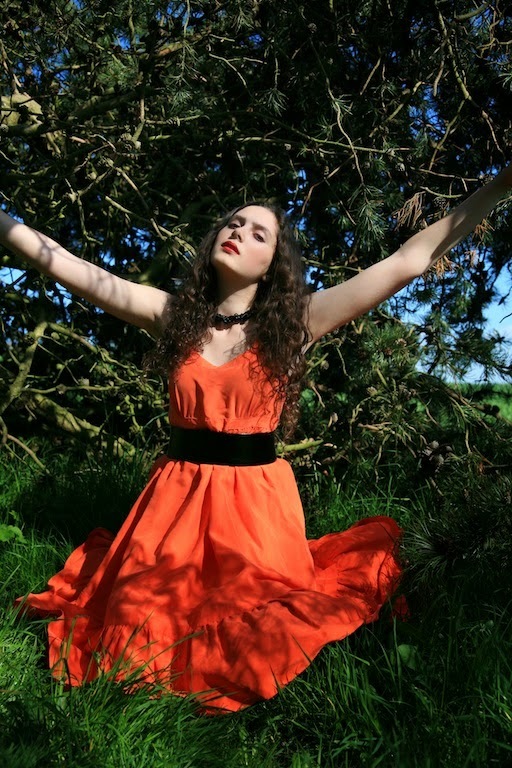 Gorgeous photos, I found the first and fifth - with you looking down from the branches, skin and silk glowing from the sun, beautiful orange dress contrasted perfectly against that (almost) cloudless, deep blue sky - particularly stunning. Envious of your bare legs and summery dressing: as I write this comment, my hands are stiff and aching from the cold. Enjoy that sunshine! I have always loved making dens, and the desire to find a wild, unique space free from the confines of suburban domesticity continues in me today, just as it has prompted many a glamping trip over the years in shepherd's huts and yurts and caravans. Your childhood dens sound magnificent, I can imagine those Heath Robinson inventions and just how much fun you and your little brother had making them! You look totally at home up in the tree, a beautiful sprite in your stunning dress, about to spread your wings and take flight into the big wide unknown.